Boyd spent several years as a creative director in advertising, winning many awards in New York, Cannes, London, Los Angeles and Sydney. Boyd now writes historical fiction. 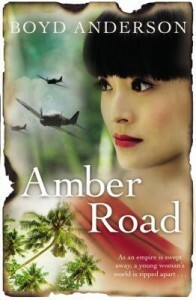 Amber Road is his fourth novel, following Children of the Dust, Ludo and Errol, Fidel and the Cuban Rebel Girls. He lives in Sydney. Boyd is Parramatta Library’s Author of the Month for March 2013. Come and see Boyd talk about his new book Amber Road on Thursday 28th March 2013 at 1.00pm in the Darug Room on the top floor of Parramatta Library. The talk is FREE Bookings are essential please call 9806 5159 to make a booking. February reading theme is Heartread – sure, it’s a month for romantic reads. Do you know this year marks 200 anniversary for Jane Austen’s ‘Pride and prejudice’? Do you know how many books written by Jane Austen? Would you like to read something else as ‘shades of love’? Well, fine out those romantic shelves at Parramatta City Library.